Ohhh boy, Samsung in 2016. You might expect this year in review to be a comedy roast. From exploding smartphones to Supreme Court cases, this was clearly not the South Korean tech company’s time to shine. Fortunately, there were enough silver linings to make up for it. The Galaxy S7 and S7 Edge were Samsung’s best phones yet. In fact, we called the Samsung Galaxy S7 Edge “the best smartphone in the world” at the time of its release. And, because of the way things panned out with the latest Galaxy Note 7, we’re inclined to say that may still be the case. However, Samsung saw success in other areas this year as well. The Samsung Notebook 9, for instance, made our best Ultrabooks list, ostensibly as a return to form for the company’s ostensibly stagnating laptop business. Meanwhile, the company also revealed one of the most unique desktop computers of the year, namely the ArtPC Pulse, which looks to finally take on Apple’s now-antiquated Mac Pro. Samsung even occupied the top spot on our best 4K TVs list with its quality backlit KS9500 range. That goes without mentioning its advancements in budget-friendly virtual reality options with its third helping of Gear VR headsets. Looking forward into the future, 2017 could potentially be a year of redemption for Samsung. Although this year brought a handful of stellar product launches, in retrospect they were all overshadowed by one monumental error – perhaps unfairly so. Samsung’s mobile business was hit the hardest this year, and understandably so. The Note 7 blunder, specifically, cost the company nearly $10 billion, according to CNN. Financial discussions aside, there’s no denying that Samsung’s mobile strategy needs to be turned around in 2017. If rumors and reports are to be believed, the company is most certainly making changes for the better. Next year, you can expect not three but six different smartphones from the Korean hardware maker. The Galaxy S8, S8 Edge, and Note 8 are all surefire hits – assuming they don’t literally catch on fire – while the company also has refreshes to its low-to-mid range Galaxy A-series smartphones in the works, namely the Galaxy A3, A5 and A7. All will have sufficient bumps in specs including the move to full HD 1080p screens and 3,000mAh batteries at the entry level. Nevertheless, it should go without saying that we can’t help but have our curiosity piqued more by Samsung’s flagship devices than its low-cost alternatives. If you were one of those who abandoned ship on Apple because of the loss of the 3.5mm headphone jack, it may be disheartened to hear that with the Galaxy S8, Samsung may also be moving to USB-C only arrangement. Like the iPhone 7, the Samsung Galaxy S8 will reportedly lose its headphone jack in favor of newer, digital interfaces. That’s right, USB-C will join the ranks of Apple’s Lightning connector in serving as a means of replacement for the antiquated (and analog) 3.5mm headphone jack we’ve all come to know and love. Of course, if that were the Galaxy S8’s only change, we wouldn’t be inclined to upgrade. Luckily, it looks as though the Galaxy S8 will also tote a bezel-free design with both the home button and fingerprint scanner built into the screen. Reports also suggest a large 4K screen, 6GB of RAM and a dual-lens rear camera, reminiscent of the iPhone 7 Plus. In another attempt to steal some of Apple’s lightning, Samsung released a Jet Black-inspired Samsung Galaxy S7 Edge color variant named Pearl Black. Assuming Samsung wants to keep its forthcoming models in line with current-gen handsets, we wouldn’t discount the possibility of the Galaxy S8 twins adopting the glossy black fashion as well. Keeping with the company’s history in revealing flagship smartphones the day before Mobile World Congress (MWC) kicks off, we can expect to see both the S8 and S8 Edge in the flesh as soon as February 26. 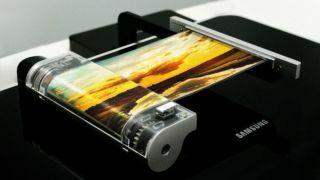 Another, more far-fetched string of gossip has repeatedly proposed that Samsung has not one, but two foldable phones in production slated for early 2017. One of these devices will ship complete with two flat panels bolstered by a hinge while the other will be sport a single OLED display and ship shortly after the first. Although it might appear unlikely at first glance, word of a Samsung Galaxy X can be found dating all the way back to 2011. Regardless of budget or personal necessity, Samsung is bound to have something for you in its – as always – vast array of mobile devices set to hit the road in 2017. Now we’re not going to sit here and pretend Samsung’s computing business has been stellar these past few years, but we’re also not opposed to admitting that this year was pretty damn great for Samsung PCs. The cylindrical ArtPC Pulse tempted us with its potent specs and luscious Mac Pro sense of style. Meanwhile the Samsung Notebook 7 Spin put the MacBook Pro to shame with an aggressive price point and uniquely HDR display. Sure, the company had some compatibility issues with Windows 10 earlier in the year, but with PCs as proficient as the Samsung Notebook 9 at the helm, we couldn’t complain too much. While we haven’t heard much about Samsung’s 2017 PC lineup, the company will undoubtedly introduce new hardware come the new year. Though it’s not a proper home computer per sé, the Galaxy Tab S2 is expected to drop in the first quarter of 2017. This will come not even a year after the release of Samsung’s most recent tablet, the Windows 10-equipped Galaxy TabPro S.
With the strong critical reception to its first shot at Windows on a tablet, we wouldn’t be too shocked to see Samsung take things a step further, opting for a desktop OS on its more affordable tablet PC. As of now, however, all we can say based on reports is that the Galaxy Tab S3 will come in two flavors, one outfitted with LTE functionality and the other without. Meanwhile, Android tablets fading into obscurity, it would make sense to maintain an exclusive 2-in-1 focus in regard to tablets. SamMobile confirmed back in August that a Galaxy TabPro S2 will arrive across four models in 2017. The outlet’s sources claim that the Galaxy Tab Pro S2 will take advantage of a 12-inch, 2,160 x 1,440 screen and an Intel Core M-series processor. Outside of that, there isn’t much concrete evidence pointing to much else as far as Samsung computers go. That said, we wouldn’t be awe-struck to see a Kaby Lake revamp of the Samsung Notebook 7 Spin after seeing how it fared with reviewers. You might say this year was the year that 4K TVs finally managed to truly shake the scene. Whether it’s owed primarily to Black Friday sales or more widely available 4K high-dynamic range (HDR) content, there’s no denying that Ultra HD is the way to go heading into 2017. With that in mind, Samsung’s KS9500 range leads the pack when it comes to delivering HDR imaging and high quality sound. Because of its overwhelmingly positive reviews, it makes sense that Samsung wants to continue from where it left off in 2017. In doing so, however, this means making some concessions while other companies move on to embrace new technologies. While the likes of LG and Sony have been quick to employ OLED display panels, VP of Samsung Display, Park Dong-Gun, admitted earlier this year that the Korean tech company would be reluctant to follow suit. Instead, Samsung plans on iterating on its existing Quantum Dot technology, which has demonstrated better clarity and brightness over its OLED counterpart. Moreover, an emphasis on Quantum Dot will allow for more competitive pricing, enabling Samsung to circumvent its OLED-hoisting opponents. Rather than taking a risk in a polluted OLED market, Samsung is choosing instead to remain at the top of a category it already reigns supreme in. Lastly, though we shouldn’t expect a consumer version to make its way to brick-and-mortar anytime soon, Samsung filed a patent back in January 2016 for a holographic TV that projects images literally off the screen. Being the ambitious pipe dream that it is, you shouldn’t expect to secure a holographic TV in 2017, but it wouldn’t take us aback to see a working prototype as imminently as CES. We may have only just recently gotten our hands on the third round of Gear VR headsets, and while it’s the perfect gateway drug for Samsung users eager to jump into PC-powered VR, it’s also far from perfect. Auspiciously, Samsung knows this. That’s why, perhaps with its next Gear VR rendition, the company plans on adding eye and mouth detection for an added layer of immersion (and virtual oddities). This is all just patent hearsay, so don’t sue us if it doesn’t come to fruition, but this does seem like a reasonable next step for Gear VR – aside from better apps and a higher resolution. All in all, Samsung has a busy year ahead of it, jam-packed with new devices and software across a wide range of categories. Truthfully, it’s rare for companies like this to deliver so many exceptional product offerings across a breadth of different hardware divisions. Here’s to hoping that in 2017, things really blow up for Samsung – just not in the way they literally did this year.